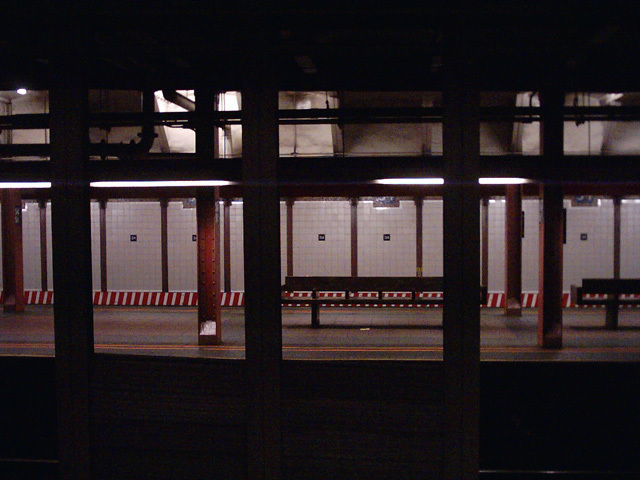 I took this picture in the eternally-sweltering 34th street subway station with my digital camera. Ive been saying that this site needs more pictures, and I liked this shot quite a bit. Of course, the great art that I create with my ghetto-rig digicam isnt worth the paper its printed on (because theyre hardly worth printing!). Its a shame, because Im creating great art every day, you know? Okay, now Im just babbling with exhaustion here. Sorry to burden your eyes with my insanity. Oh, but the board works again and theres a new feature with the votes on the poll showing up after you vote. But thats all. At least for now. Its time to go fight being asleep for another 3 hours or so until I can escape and sleep for real.